An interview with Captain Nicolo Bommarco, Hotel General Manager Emilio Mazzi and Cruise Director Richard Joseph. Left to right: Cruise Director Richard Joseph, Captain Nicolo Bommarco and Hotel General Manager Emilio Mazzi. In 1998, the mega-cruise ship Grand Princess entered service. This design has been so successful that since then all the ships that have been built for Princess Cruises have been based on the Grand design - - all but two that is. Those two are Island Princess and her sister ship, Coral Princess. The fact that Princess diverted from the popular Grand design to build these two ships is a first indication that they are special. The two ships were built by Chantiers de L' Atlantique in St. Nazarie France, the same shipyard that built the legendary ocean liners Normandie, France and Queen Mary 2. "This [ship] is a bit upper class, technically speaking," noted Captain Nicolo Bommarco, who has sailed on nearly every ship in the Princess fleet. At 91,627 gross tons, Island Princess is a large cruise ship but not as large as the Grand class ships which range from 108,000 to 113,500 tons. However, "We are longer than the Grand class ships," Cruise Director Richard Joseph pointed out. Mr. Joseph has worked on cruise ships since he was 15 and has brought several ships into service. "We are thin and we are longer," continued Captain Bommarco. "The shape of the hull keeps the ship better than other ships. Even with a rough sea, we can still keep [a speed of] 20 knots. With other ships, you have to reduce to even 4 knots, otherwise you break everything." In other words, Island is a good sea ship that handles the sea well. However, Island and her sister were not built to be ocean liners doing transatlantic crossings. Rather, their primary reason for existence is that the Grand class ships are too big to go through the original locks of the Panama Canal. Since Princess wanted a pair of large ships that were capable of transiting the Canal, Island and her sister were built to the maximum dimensions that the locks will allow. "They call them 'Panamax," explained Hotel General Manager Emilio Mazzi, who joined his first cruise ship in 1968. As a result, when Island goes through the Canal's locks, the walls of the locks are within arm's length of the sides of the ship. "We don't have much space fore and aft when we are in, something like 20 meters," added Captain Bommarco. Whereas quite a few cruise ships re-position from the Atlantic to Pacific (or vice versa) each year through the Canal, Island Princess and her sister are Canal specialists. As Mr. Mazzi pointed out: "We don't do that cruise just once or twice a season, we do that it regularly." From Fall through Spring, the two ships visit the canal on a regular basis. Broadly speaking, they do two types of cruises; what are known in the industry as partial transits and full transits. The partial transits are ten-day cruises that leave and return to Fort Lauderdale, Florida. On the way to the Canal, the ship makes a half day call in Aruba and a full day call at Cartagena, Columbia. At the Canal, it goes through the Gatun Locks into Lake Gatun where it spends the day. It then exits through the Gatun Locks and docks at Colon, Panama to pick up passengers who were tendered ashore when the ship was in the lake. Returning to Fort Lauderdale, the ship stops for a day at Puerto Limon and then either Ocho Rios, Jamaica or Grand Cayman. It is not your typical Caribbean cruise. "I think the attraction here is the Canal and there is less emphasis on [the islands]. They come for the Canal. You get the real sailors here They have seen the sunny places and done that," noted Mr. Mazzi. As a result, Island Princess tends to attract more North Americans and fewer Europeans than other Princess ships sailing the Caribbean. "For the Europeans, [coming to the Caribbean] is something new, so they want the typical things, the high life of the Caribbean islands." But this is not to say that this cruise does not have opportunities for fun in the sun. "Following the Canal is when we have our good, long port days. For the segment of people who really want to get to the beach and spend the afternoon there, that happens on the two port days following. We have the full day in Costa Rica and the full day in Ocho Rios or Grand Cayman." Mr. Joseph explained. A full transit begins in Fort Lauderdale and ends in Los Angles or vice versa. The ship calls at ports in the Caribbean and along the Pacific coast of Central America along the way. "It is exciting to go from Atlantic to Pacific. The Pacific ports are slightly different. The situation in Mexico obviously has created some itinerary challenges for us because ports that we would traditionally stop at, you can't stop at. But hopefully that is going to come around and change." 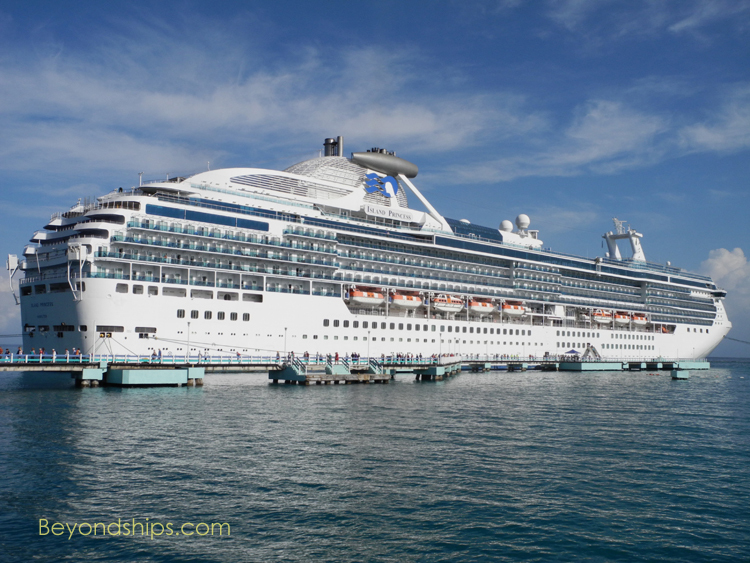 During the summer season, both Island Princess and Coral Princess do Alaska cruises. "Alaska is very nice. It is peaceful, it gives you a sense of peace. Aside from the beauty, it is easy to communicate and everything [in the ports]." Mr. Mazzi commented. "It is a real wow experience," Mr. Joseph added.. "When you are at sea, those days are even more spectacular because you are cruising in fjords with snow-covered mountains. The passengers are so happy with what they are seeing ashore. They are so well entertained by Alaska, that it makes my job even easier. It is really more about the whole Alaska experience. It is my favorite destination." Regardless of which itinerary it is on, Island Princess is a floating resort. While the atmosphere is relaxed and the décor varies from the traditional to the contemporary, the high service standard is like that of an old world grand hotel, reminiscent of the days of the great liners. "I think so because the tradition stayed," Mr. Mazzi said. Although Island Princess is a large ship, it is not a crowded ship. Its passenger space ratio is higher than any in the Princess fleet and higher than many premium and some luxury cruise ships. "Sometimes the comment that we hear is: 'where are the people?" . The large public rooms include two major entertainment venues, the Princess Theater and the two-deck high, cabaret-style Universe Lounge. Both of these are used for activities including shows by visiting artists and production shows with the ship's singers and dancers. "The cost of mounting these production shows is astronomical. We are talking a million or more dollars a show between costumes, click tracks, choreography design, scenery design," Mr. Joseph pointed out. At the same time, the entertainment is dynamic. "We are constantly changing the shows. We change the shows every six months when a new cast comes in to learn it." "We have to make sure that we have a product to appeal to everybody. The company is constantly sending us demographic information. We know the average age of the passengers, the nationalities of the passengers so we as a ship management team will look at it and if we see a flag of a younger demographic then the hotel director will advise me to get on the phone to the entertainment department just to make sure that they are aware that our needs are going to change." In sum, why should someone select Island Princess for their vacation? "Because it is the best ship in the fleet," Captain Bommarco said with a proud smile.